Robust fixation of implants is very important as in younger patients these joints are required to last 20 to 30 years or even more. Charnley used a material called acrylic bone cement to fix the implants to the bone which had previously been used by dental surgeons and this material can still be very effective. The bone cement is made by mixing a fluid component with a powder component and the liquid becomes doughy within a few minutes, becomes like putty within about four of five minutes and most cements set around the ten minute mark. The exact setting characteristics of the cement do differ somewhat depending on the different types of materials used in the bone cement. So some bone cements can set quite quickly in five minutes and others can set over a longer period over 15 minutes. Once set the cement is very strong under compression and forms a very good bond between the prosthesis whether it be the femoral component or acetabular component or indeed the femoral component of a knee replacement or tibial component of a knee replacement. Various histological studies and long term follow ups show that this bone cement can maintain excellent fixation over many years. 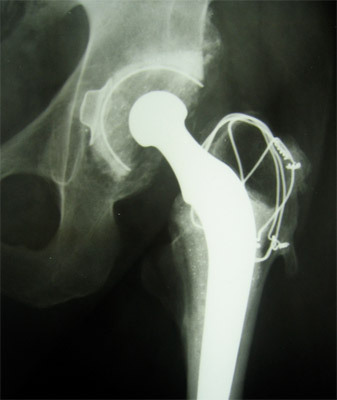 X-ray showing a cemented Charnley total hip replacement which has been functioning well for 28 years and still shows no signs of wear or loosening. However, other innovators have used uncemented fixation, that is a fixation not reliant on bone cement and in uncemented fixation the surgeon creates an accurate shape within the bone to accept the component which is press-fit. Bone grows into the surface of the component over a period of normally 12 weeks or so. The surface of the components are often textured or microstructured or porous to allow bone to grow into the surface of the implant (although this is not always the case) and some designers advocate a surface coating, normally hydroxyapatite which is bone inductive, in other words encourages the bone to grow onto or into the implant. (Picture of a surface coating). There has been a general trend over the last five to ten years to use more uncemented devices and this is probably reflective in improved designs and to some extent better surfaces and perhaps in relation to hydroxyapatite.